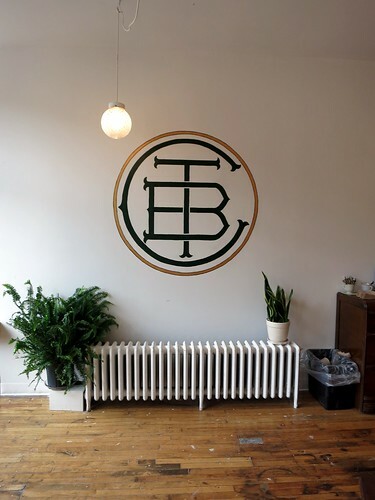 Through Being Cool Vegan Bakery in Toronto – New! – vegan in your city. Home toronto Through Being Cool Vegan Bakery in Toronto – New! 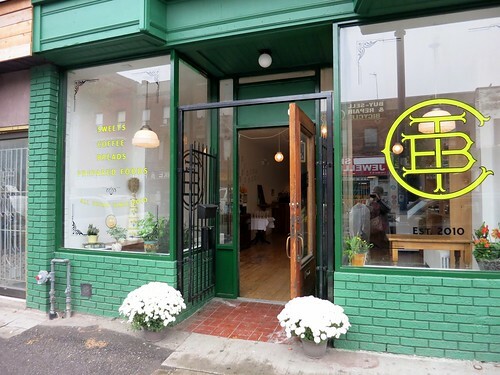 So the vegan internet has been a buzz about Through Being Cool Vegan Bakery opening up to the public this weekend. 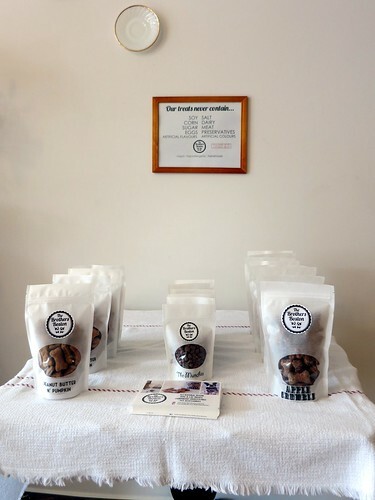 You might have tried Through Being Cool baked goods before at other places around the city – I know I’ve eaten some delicious examples of their skills a few times at Disgraceland. Unfortunately, I was out of the city for an organizing meeting at a cottage this weekend (okay – it’s not really that unfortunate), so I missed TBC’s opening day on Sunday, September 29th, But JC was kind enough not only to bring home a box of donuts and whoopie pies, but took a bunch of pictures too so i didn’t feel like I missed out. What a sweetie. Of course, on Monday I was in the area (and made sure I was in the area) picking up my wedding dress (ack), so I walked over to Through Being Cool and checked it out. However stressful and cumbersome it is to travel around with a large dress bag as a non car-driver, donuts help and felt like a natural pairing at that moment. It’s quite a lovely space, but don’t take my word for it. Go there yourself. 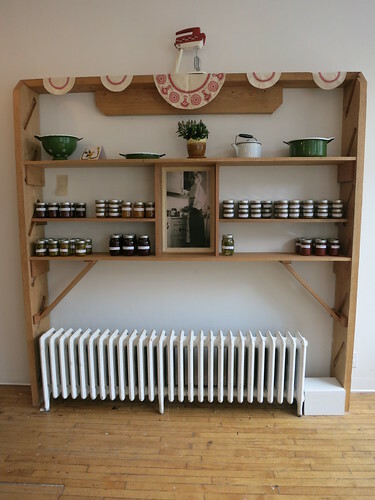 First thing I noticed when I walked in were the shelves covered in preserves. 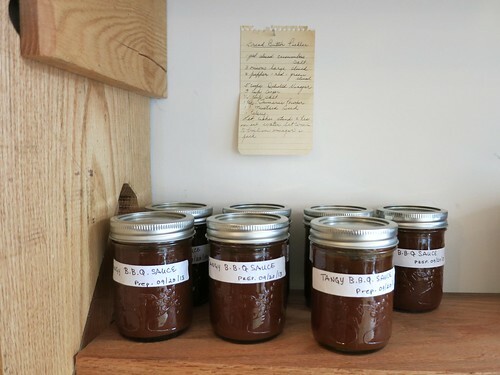 There is ketchup, BBQ Sauce, as well as varieties of pickled vegetables, mustards, and sauces. 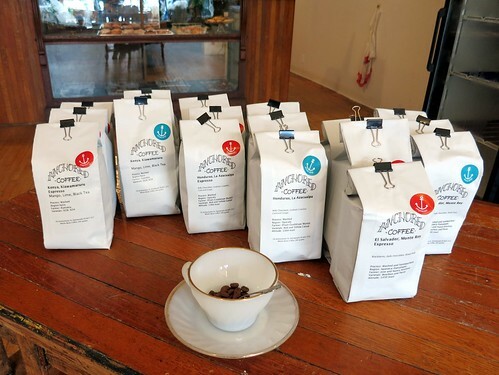 The company buys all of their coffee at ethical prices direct from farmers in Central and South America, roasts in Nova Scotia, and recently won a $100K BDC Young Entrepreneur Award. Nice! Now, let’s talk about the food & drink. JC teased me with pictures of delicious looking spicy pizza buns from Sunday, but unfortunately, there were no pizza buns when I got there on Monday. 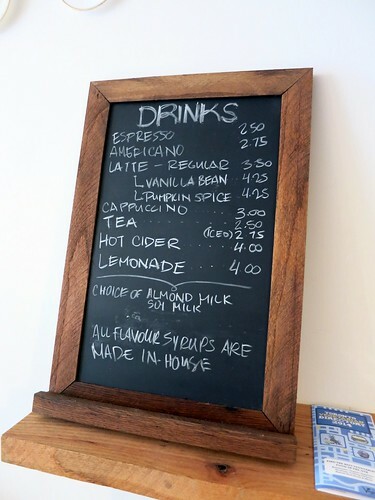 TBC has either soy or almond milk to choose from for any fancy coffee drinks, and they make all of their own syrups. 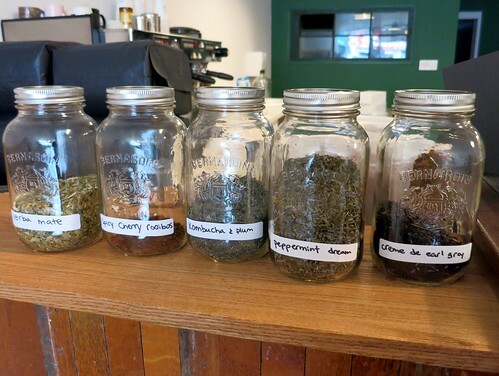 Other hot drinks besides coffee include cider and assorted teas from Herbal Infusions Tea Co. The Pumpkin Spice Latte really hit the spot, especially on the grey and dreary fall day we were having, and I’d recommend you give it a try, especially if you were one of the folks sad to hear that Starbucks Pumpkin Spice lattes aren’t vegan. 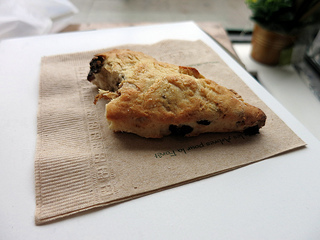 The above scone was more chewy than flaky, but still maintained scone like flavours and consistency, and I would eat it again if given the opportunity. Since it was going to be a TBC kind of day, I also picked up one of their frozen to go options. They have a variety of bakeable containers in their fridge and freezer, and while my first impulse was to find the potato & cheddar pierogies, they were all out, so I went with the next best thing. A small plastic bag of Ricotta Ravioli. 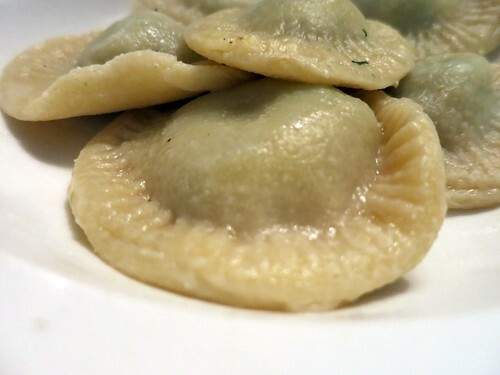 One bag had at least 12 large Ravioli in it, stuffed with spinach and some kind of ricotta like filling. There are no preparation instructions on the bag, but if you’ve ever made pasta before, you know what it’s supposed to look like. I threw the frozen ravioli into salted, slightly olive oiled, boiling water, and boiled it on med-high for about 10-12 minutes and drained it. Best of all, and a detail that doesn’t matter that much to anyone but me, is that Through Being Cool is a super close, super tasty vegan bakery that’s within a few kilometers of my house, but just far enough that I don’t go there everyday (even though it is tempting). It’s also incredibly easy to get to for everyone else with access to the TTC – just get out at Landsdowne station, cross the street, and walk eastward on Bloor Street. They take cash and debit. Closed on Mondays. bloordale, Through Being Cool, toronto, Vegan Bakery. Bookmark. End of #VeganMoFo – Vegan Wedding Edition – Weirdest Giveaway? You’re Invited. Things I Love Thursday: Wedded Edition. Is the name of the bakery a Saves the Day reference? 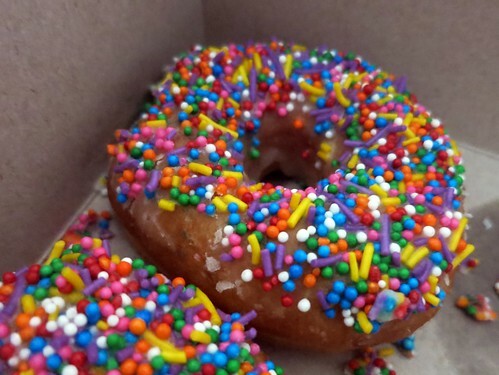 These donuts look so good – I haven’t had vegan donuts since Las Vegas in April! Seems long, right? Now once I head back to Oregon in November, I’m so picking up my Voodoo Donuts because I’m desperate for one! 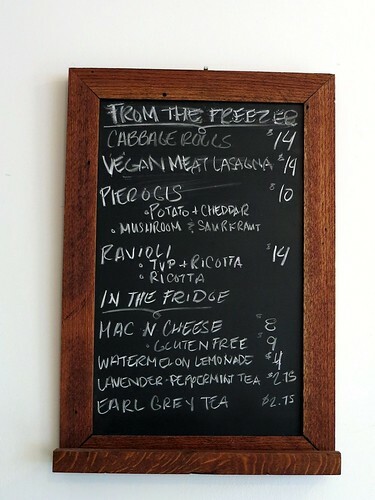 That bakery looks really cool and hip – love the chalkboard including the “Vegan Meat Lasagna” – mmmm! If you ever find yourself in Toronto do go here. There are lots of lovely places in this city, and this one is way up there. Not all out! I got a bag of the potato cheddar a few hours after you. It was unlabelled. I had to ask them if it was the right one. Though on the bright side… our ravioli dinner was still delicious. Glad to hear it! I got both. I think the ravioli I got is the ricotta. But not sure, again, it was unlabelled. We’ll have to see. I’m going to go there this weekend! I’m so excited! Their vegan sausage rolls look AMAZEBALLS.